, a Milesian, who was born about the fifty-sixth olympiad, or B. C. 556, was a hearer and companion of Anaximander. He followed the footsteps of his master, in his inquiries into the nature and origin of things, and attempted to cast new light upon the system. He taught, that the first principle of all things is air, which he held to be infinite, or immense. Anaximenes, says Simplicius, taught the unity and immensity of matter, but under a more definite term than Anaximander, calling it air. He held air to be God, because it is diffused through all nature, and is perpetually active. 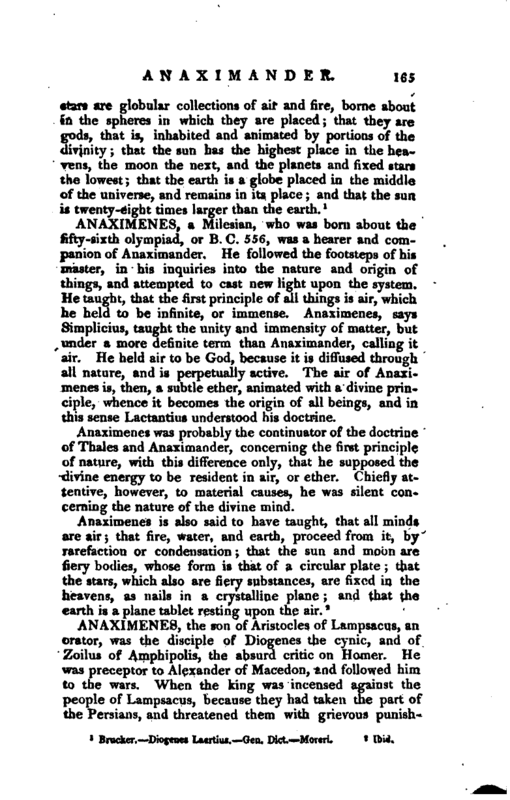 The air of Anaximenes is, then, a subtle ether, animated with a divine principle, whence it becomes the origin of all beings, and in this sense Lactantins understood his doctrine. Anaximenes was probably the continuator of the doctrine of Thales and Anaximander, concerning the first principle of nature, with this difference only, that he supposed the divine energy to be resident in air, or ether. Chiefly attentive, however, to material causes, he was silent concerning the nature of the divine mind.